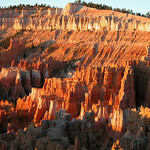 With this post I hope to start a weekly series on America’s national parks and monuments. 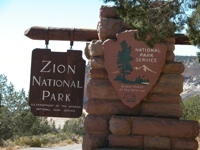 In southern Utah, only a few hours drive from Las Vegas is Zion National Park. Early mormon pioneers gave this spectacular valley heavenly names like Zion, Angel’s Landing, and The Great White Throne (of God). 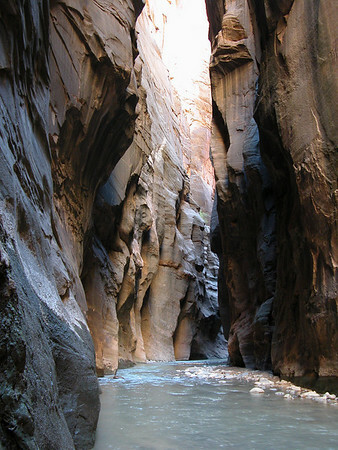 It is not surprising that finding Zion would give a traveler a view of heaven. 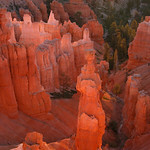 In Utah’s first national park even those who never get out on any of the many hiking trails can appreciate the natural beauty. I would recommend that you get out of your car (shuttle busses don’t run in the winter months) or off of the shuttle bus. 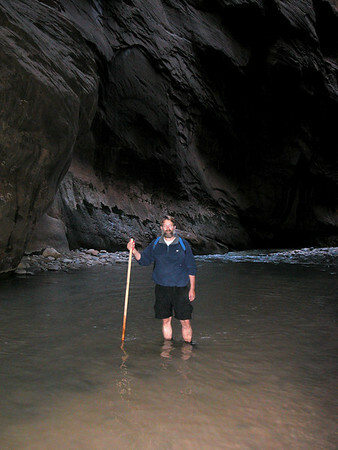 The one hike that I would recommend is an unusual one which is the hike up the Virgin River to the “Narrows”. 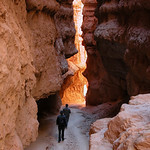 This is a slot canyon that at times is 20-50 feet across and up to 2000 feet deep. When you hike the river, I really mean you hike the river. You will get wet. Hikers can visit a local outfitter who can provide you with water-proof boots and socks, a walking stick (surprisingly useful) and a dry bag for your camera. Before you start a hike up the river (or the longer 2 day hike down the entire length of the canyon) you first need to check the weather report at the visitor’s center. This is not the place you want to be in the case of a flash flood caused by rain in the area. 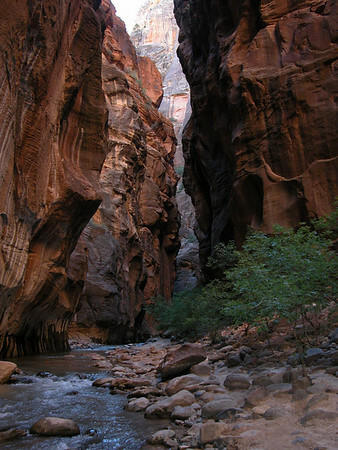 When I hiked the narrows I took the first shuttle bus of the day into the park. I hiked for 2 hours up the river to the deeper water of the Narrows. In all that time I did not run into any other hikers. It was just me and a beautiful landscape. It was not until I turned around that I ran into other hikers. The level of the water was generally reaching no higher than my knees but the depth will depend on the time of year and the snow melt. It is not a difficult hike but it does take a sense of adventure and a willingness to get wet.